Trying to build a home out on the farm without good access to electricity or my tools just wasn’t feasible. I was naïve to think I could do that all by myself. I sat here for several months with my tail between my legs. However, there was a solution to the problem. I could construct a tiny house at my current residence, and drive it to the ideal site on the farm. Why didn’t I commit to doing this sooner?! Word got around that I was planning to build a tiny house and a buddy informed me that a mutual friend was also in the process of building a tiny house. A few days later we met up and he showed me his build. We discussed details and he gave me some great pointers. It really gave me the confidence to get started immediately. 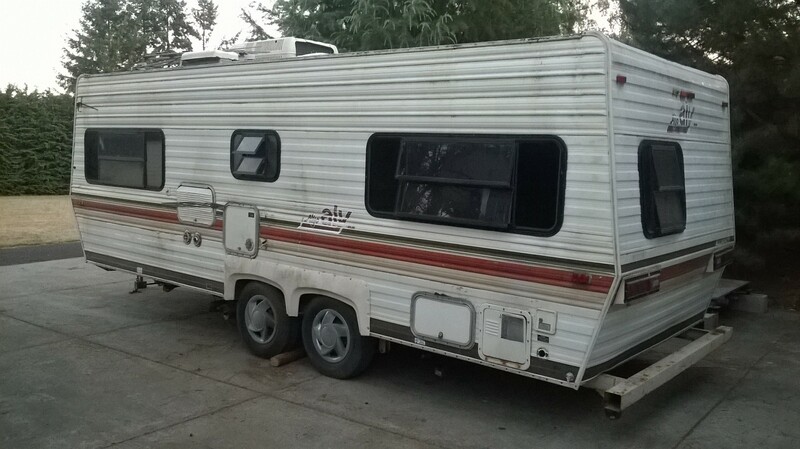 That week I acquired an RV trailer on Craigslist from a good ole boy in a nearby town. He was a great guy; the father of a soldier about to attend jump school like I had done many years ago. We instantly hit it off (which was more to his benefit than mine as my price negotiation skills are awful with people I like). Several trailers had been sold out from under me already and I needed to get this build started if I wanted to beat the rainy season, so this was the one. We shook hands and I purchased the future foundation of my tiny house for $400. The trailer smelled like something had died inside of it. Seriously it was gross, but the frame seemed in good shape and it had some other parts I figured I might be able to sell to recoup some of the initial costs. 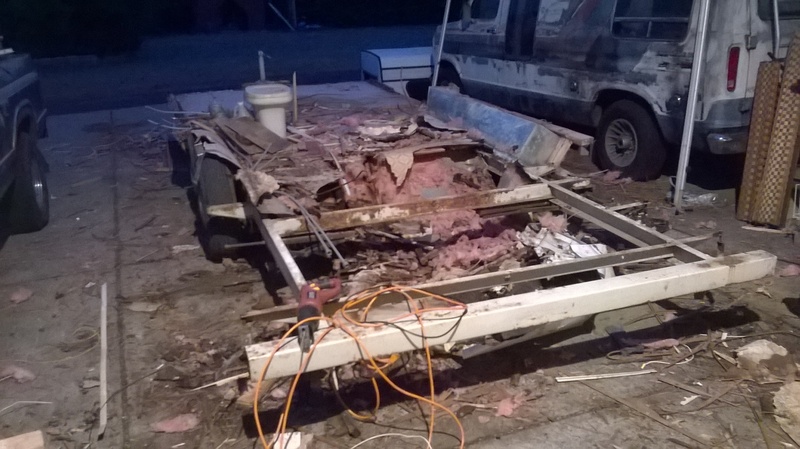 The first step was to demolish the trailer. This was a lot more fun than it sounds. I stepped inside with a sledgehammer and all the pent up resentment in my heart from recent struggles in my personal life… and went to pound town. 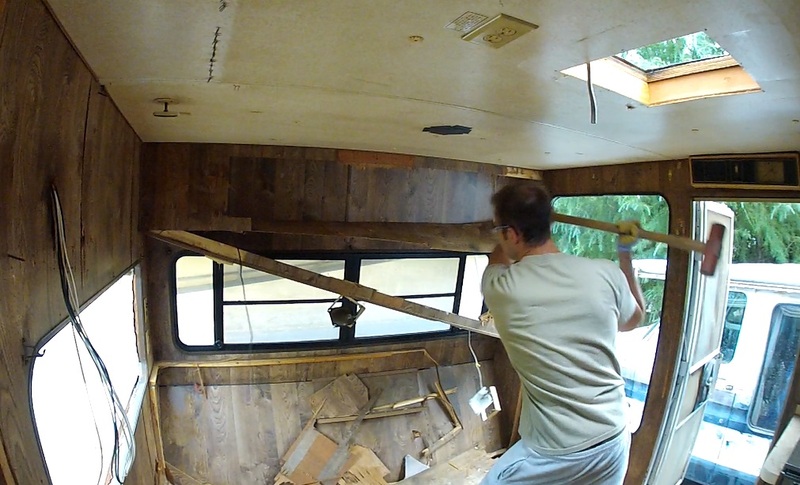 I bashed and smashed and Sparta kicked until I could barely lift the hammer anymore. Finally I took a break to get rid of the giant mess I had created. I threw some of the smaller wood chunks in the burn pile with our lawn debris. The rest went on a pile that would later be hauled to the dump. 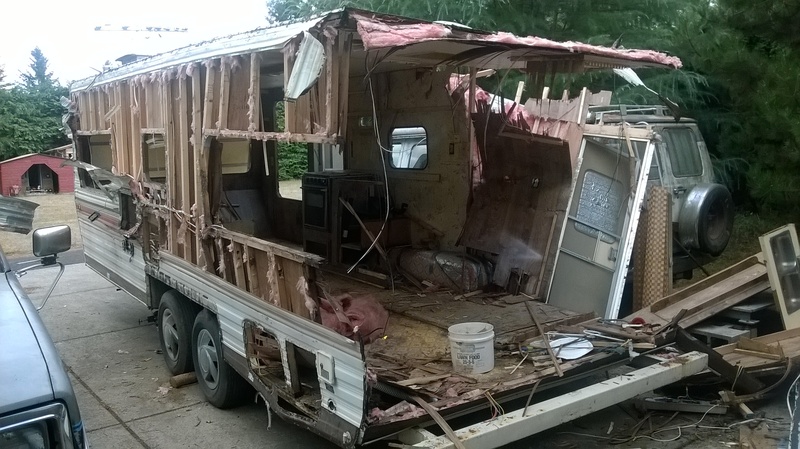 Unfortunately the wood wasn’t even salvageable as it had taken on the awful smell from the trailer. Turns out there was rotting chicken livers inside of the oven. I removed the stove with them still in there… it smelled that bad, I didn’t even want to open the oven door again! The metal siding I kept to sell for metal scrap, but first it would need to be cleaned. 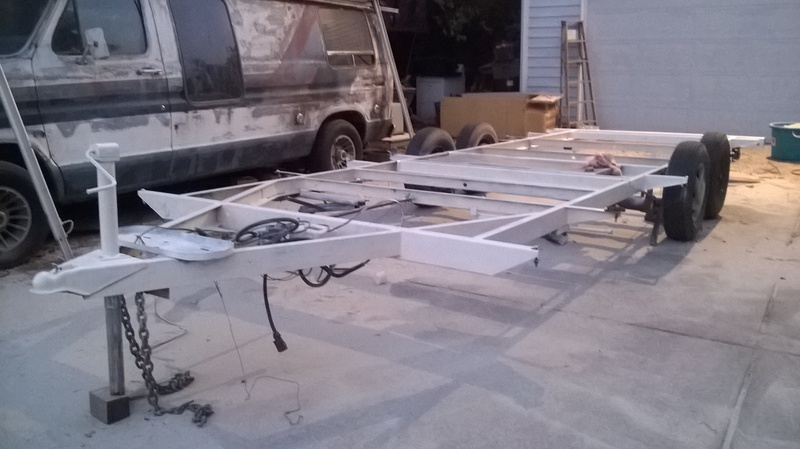 After the camper and blackwater tank were removed, the frame was exposed and ready for touchup. 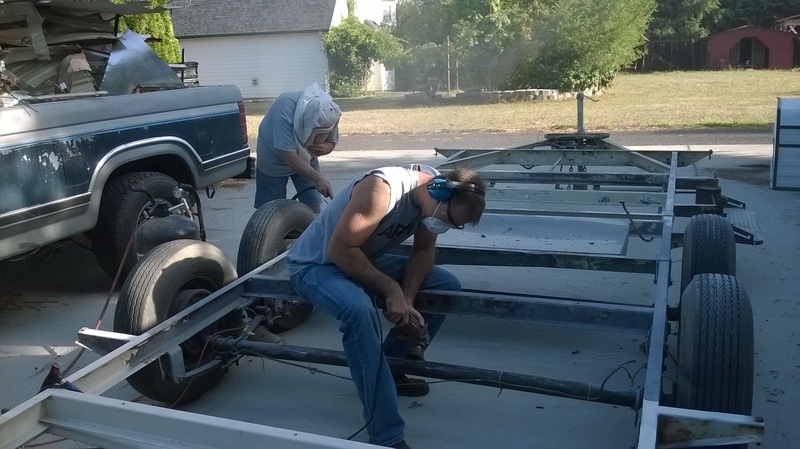 I used a grinder to remove surface rust from as much of the areas as possible while my father hit the tight spaces with the sand blaster. 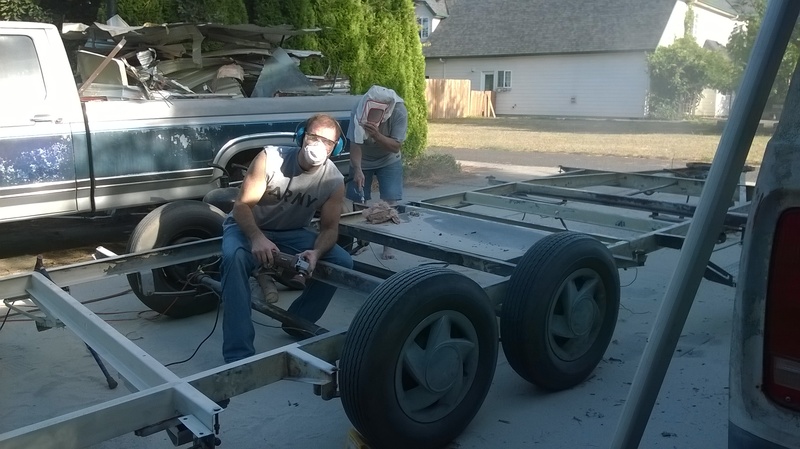 We repainted the frame with some rattle-cans of Rustoleum to prevent further surface rust. Next on the agenda is to remove the axles to ensure they are serviceable and to weld a few additional supports onto the frame. This is awesome! Can’t wait to hear more. Thanks Barbara Jo! As you know I’ve been planning this project for a long time. It’s nice to finally be bringing the plan to life! What were the dimensions of the trailer? 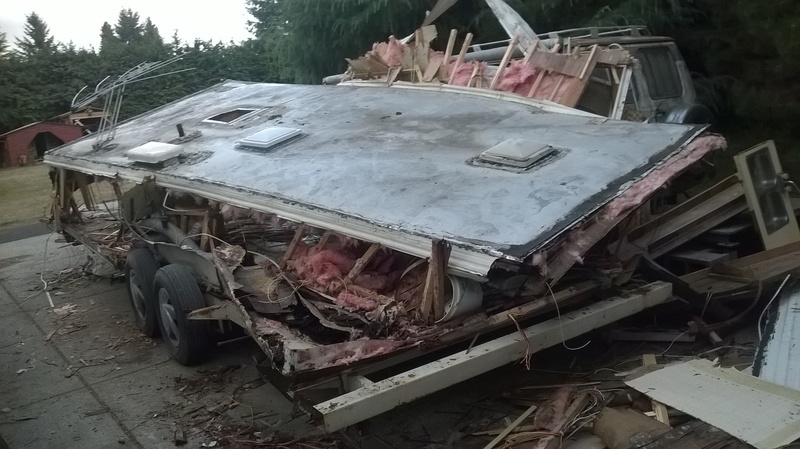 I’m looking at the trailer on the side of my dad’s house as a potential, future tiny house (beyond distant future, but at least it would serve a purpose again). It might be too small and I would think that’s a concern for the main frame of the build. Adding onto it might not be the safest idea in the world for something that’s going to be stacked with functional use–what I love about tiny houses. The project looks to be well on its way, I can’t wait to hear/see more! Great job, Craig! Hi Rachael. Thanks for the great feedback! My trailer was a 24 ft trailer including the tongue. The dimensions of build-able space are approximately 7ft wide by 20ft long. 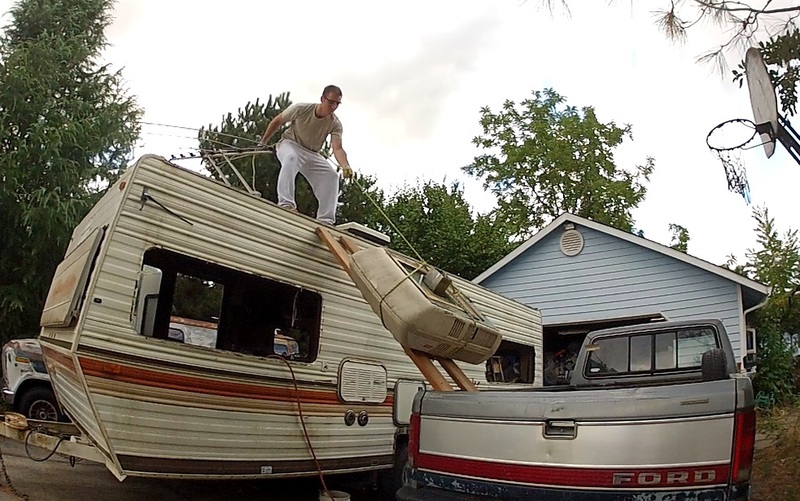 The trailer stands 1.5ft off the ground. Trailers can be 13.5ft tall if you want to tow them on the road, which leaves me around 12ft of vertical space. 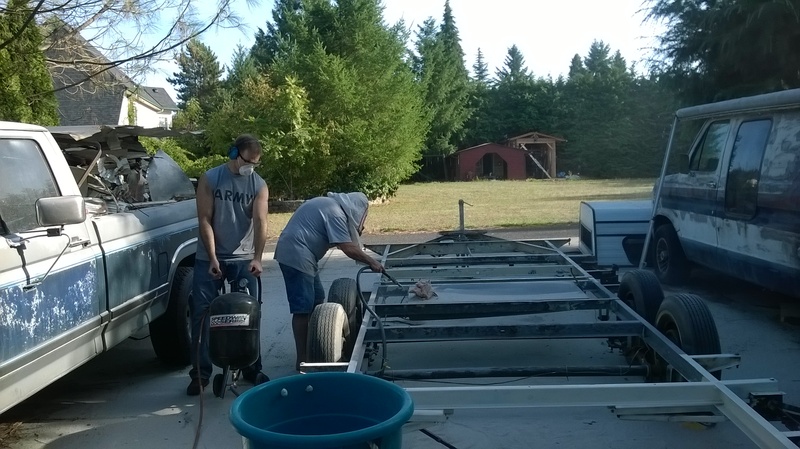 I mainly went with this trailer because it only cost me $400 and some sweat equity whereas some new tiny house trailers of comparable size cost over $3500! As for your build. The main thing I’ve found is to see how much weight the trailer is rated to handle, and how much weight the axles are rated to handle. From the research I’ve done most wheel axles with 5 lug-nuts are rated for 3500lbs. 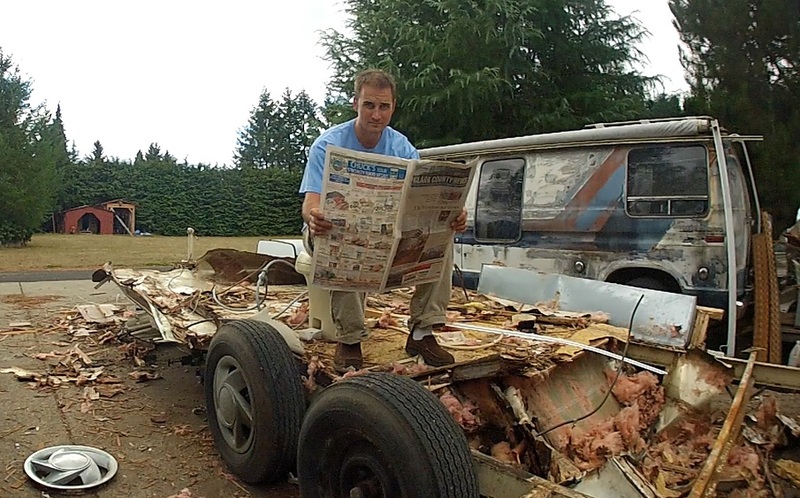 The next step for you would be to check the weight ratings on your trailer, and that will give you an idea if it could handle the weight of a tiny house built on it. 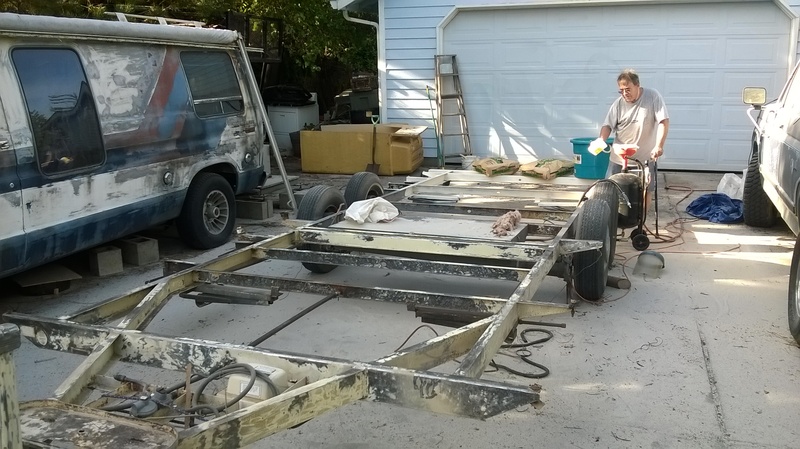 During the planning stages you add up what you anticipate the weight of the house, appliances, and trailer to be, then subtract that number from your total weight capacity. I’ll be posting some more in depth stuff about the planning process, my plans, and the weight calculations in the near future. I’ve just been spending most of my time on the build itself right now so haven’t written it up yet. I hope that answered your questions. Hit me up with more details about your trailer and we’ll chat more. Hi Craig, Hows the Tiny Home come along? Do you have anymore news to share? Exciting! Looking forward to seeing your progress! Thanks Amber! I’m super excited about this project. I’ll open it up for everyone to come check out once it’s finished.